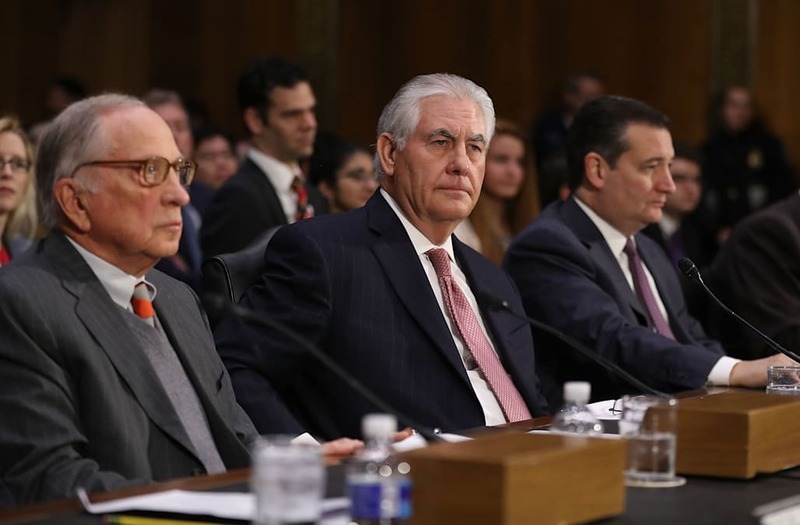 Donald Trump's secretary of state nominee Rex Tillerson testified before Congress on Wednesday that Russia "poses a danger" and must be held accountable for its actions regarding the 2016 presidential election. Tillerson -- who sat as CEO of ExxonMobil for 10 years -- faced questions from the Senate Committee on Foreign Relations regarding his views on foreign affairs, reportedly close relationship with Russia and whether his record of corporate management deems him fit to assume the role of secretary of state. Sen. Marcio Rubio was quick to challenge Tillerson over the CEO's stance on Vladimir Putin, asking the nominee whether he believes the Russian leader is a "war criminal." Tillerson said he would not use that term -- to which the Florida senator responded with a laundry list of Russian offenses against Aleppo and Syria at large. Tillerson stated he would need more information on Aleppo before naming Russian acts as war crimes, to which Rubio retorted, "None of this is classified Mr. Tillerson, these people are dead." As the former CEO of the largest privately-owned oil company in the world, Tillerson's record of cutting global deals with authoritarian leaders also came into question on Wednesday, when he was asked whether he would take meetings with Exxon leadership as secretary of state. Tillerson was also pressed on whether his private-sector interests would carry over into his executive branch role. When asked about imposed sanctions against Russia, Tillerson claimed he never lobbied against sanctions. His statement, however, contradicts lobby reports that show ExxonMobil lobbying against sanctions as recently as Q2 of 2016. Sen. Rubio also pressed Tillerson on Russia's assumed hacking of the 2016 presidential election, asking whether Putin would have had to be aware of the nation's involvement in the election happenings. Tillerson responded to Rubio's question stating, "I think that's a fair assumption." As was present at Tuesday's committee hearing on Trump's attorney general nominee Jeff Sessions, protestors were escorted out of the room multiple times throughout the hearing. Most could be heard rebuking Tillerson on climate change related issues, from Hurricane Sandy to outdated pipelines in Texas. One woman could be heard as she was escorted out of the hearing room, saying, "Senators, reject this man, protect the vulnerable." The Exxon official responded to a question on America's role in combatting climate change, to which he responded that the United States should "maintain a seat" at the table, and described the issue as one that cannot be resolved by one country and requires a "global response." He later went on to state is personal position on climate change, saying, "The risk of climate change does exist," and "The consequences could be large enough that actions should be taken." When asked whether he believes "humans" are responsible for climate change, Tillerson pivoted and called out increases in greenhouse gas emissions as "having an effect." He then noted he believes the ability to predict said effect is "very limited."